Christmas gift ideas for your favourite art lover under $30. 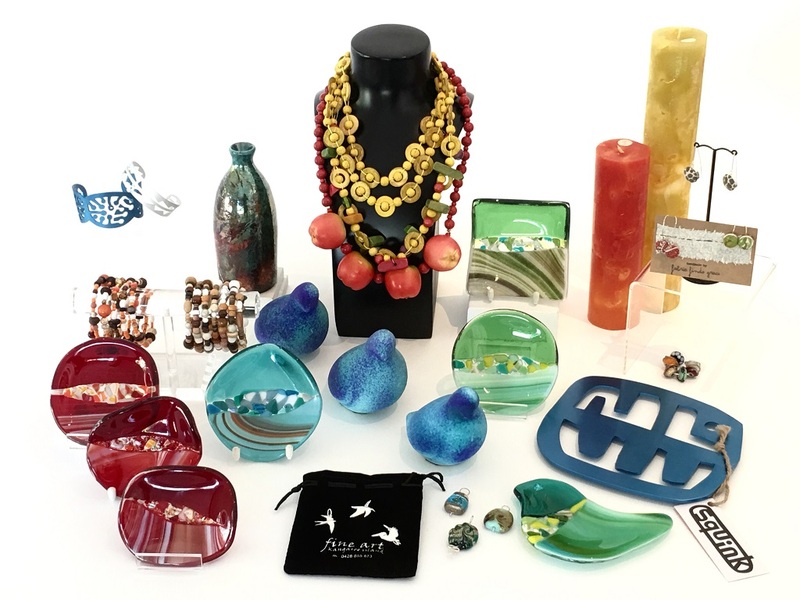 Clockwise from bottom left: Patti Blucher, long hook silver wire earrings with Random Gathering beads; Chris Guthleben small ceramic blue birds; Small raku bottle; Anne Morrison glass Xmas Tree ornaments, birds and fish; Coral Duncan hanging hakea birds; Anne Morrison fused dichroic glass earrings; Simply Bea Glass heart pendants; Ann Lashmar hand made cards; Fabric Finds Grace Lilly Griffith vintage fabric and wooden earrings; Anne Morrison fused dichroic glass pendants; Squink Kangaroo and Koala jigsaws. It’s time for choosing Christmas gifts. December should be the most wonderful time of year, but searching endlessly through the same old offerings can steal the joy from your season. Today we’re here to show you the secret to inspiring and effortless Christmas shopping. We’ve made it easy for you to choose a gorgeous, original gift for all the special people in your life by grouping them according to price. So if you know how much you’d like to spend, you’re already well on the way to solving your gift buying challenges. Even better, you can do it all in one place. That should put you in the mood for a little celebrating! Let’s get started with the fantastic selection of unique art pieces displayed in the image above. Whether you’re buying Christmas gifts, or spoiling yourself a little for the season, we know you’ll find something here that brings you joy. These delicate earrings are re-imagined from a seemingly endless collection of jewellery components gathered from Patti’s friends. At this price, grab a pair for yourself and sparkle at your next Christmas party! Chris Guthleben has been wowing us all for years with the amazing glazes and finishes she turns out of her ceramics studio. We can’t take our eyes off these vibrant little blue birds here in the gallery. If there’s someone on your list with an affinity for gorgeous patinas and equally gorgeous bottles, our work is done. We feel it only right to warn you, it’s likely these will end up decorating your own home once you buy them. Let’s face it, they are impossible to resist. But don’t think this is a fail in our fine art gift guide. They’re absolutely perfect for the person in your life who’s just that tiny bit obsessed with everything Christmas. These cute little guys are created from hand-gathered hakea pods and other natural treasures. Perfect for sending that little bit of Australia to friends elsewhere. Already decided on beautiful earrings above, but still need some that are totally different? Grab these beauties for the person who loves dramatic colour and shine. Want to give your heart to someone this Christmas? These colourful heart shaped pendants are the perfect way to do it. Two solutions in one, these stunning hand made cards reflect the traditional colours of Christmas, but honestly, they’re so beautiful, there’s no chance they’ll be thrown away. We can absolutely see them as gorgeous framed keepsakes your friends and family will want to treasure forever. Still searching for that perfect pair of earrings? Gorgeous doesn’t even begin to describe them. Careful though, it will be hard to buy just one pair, once you’ve seen them. So you were looking for a gift with a price tag a little closer to that $50 mark? You’re in luck. Big time. Grab one of these and pair it with the earrings to match (above). Job done. Thought you wouldn’t find anything for the kids in a fine art gallery? Think again. These cute and colorful jigsaw puzzles are perfect for the smaller humans in your life. Christmas gift ideas from our fine art collection all under $50: Anne Morrison NEW small free form round dishes various colours; Audrey Harnett Twistie bead bracelets; Cecilia Gunnarsson sm cuff bracelets; Chris Guthleben Green Raku Bottle, two sizes; Ceramic Doves, two sizes; Patsy Verwaal Apple and Bead double necklace; Anne Morrison small square glass plate; Fleur Peters hand made scented candles, two sizes; Fabric Finds Grace by Lilly Griffith silver and vintage fabric earrings; Simply Bea lamp worked glass pendants; Cecilia Gunnarsson Trivet, various colours; Anne Morrison Glass bird dish; Simply Bea lamp worked glass pendants; Fred Peters Sterling silver charms. With a little more to spend there are even more fabulous art pieces you can add to your Christmas gift buying list. Let’s take a look at the items available right now at Fine Art Kangaroo Island with a price tag under $50. NEW style, same breathtaking quality. We had to keep from snapping these little beauties up ourselves. After all, they’re so Christmassy, don’t you think? Buy as a gift or add them to your Christmas dinner table. Just the gift for bracelet-loving friends. Need a little something different for your gal pals? These could be your answer. Another in the stunning anodised aluminium Squink jewellery range. So many options to choose from! Some larger options here to match those lower priced items above. Buy multiple sizes and create a set. Patsy’s quirky flair for upcycling is fueled by an insatiable desire to create, and treasures gathered over a lifetime of collecting. These eye catching glass plates are available in so many colors and designs. Buy just one, or match them together as a set to create a slightly more expensive gift. You’ll love them, and so will those you buy them for. Know someone who loves to fill their home with the colours and scents of the Australian bush? These pretty scented candles are the perfect gift. Every individual piece is a tiny work of art. Inspired by the colours and patterns of some of Lilly’s favorite things – eye-catching vintage fabrics. Need to buy for someone who’s a collector of those mass-produced modern charms? These tiny glass wonders are fully compatible with the popular bracelets, but totally unique and so much more beautiful. The red or gold versions of this quirky anodised aluminium trivet is just the thing for christmas entertaining. If you have a die-hard foodie on your list, it could be the answer to your prayers. Reminiscent of the incredibly popular glass birds featured above, this super-cute dish will make an eye-catching statement wherever it lands. Lovingly worked by hand, these gorgeous little artworks are so incredibly affordable. Who knew handmade could be so beautifully inexpensive? Have a silver charm-collector on your Christmas list? These delicate sterling silver charms are unbelievably well priced. Don’t miss your chance to grab one. 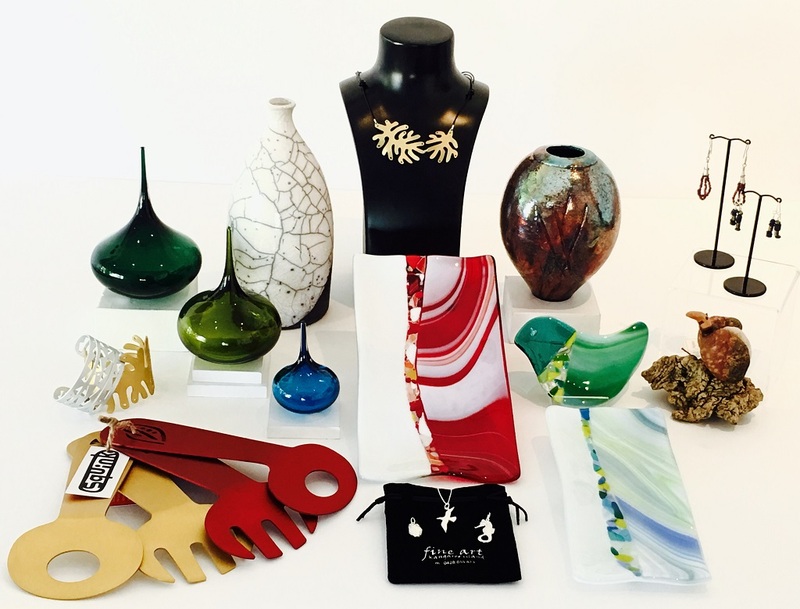 Gorgeous Christmas gift ideas for under $100: Cecilia Gunnarsson Salad servers, various colours; Cecilia Gunnarsson Cuff, small or lge, various colours and designs; Llewelyn Ash Lucky Drops, two sizes, various colours; Chris Guthleben raku bottle, size 4; Cecilia Gunnarsson Seaweed necklace, gold or silver; Chris Guthleben Raku vase; Peggy Rismiller semi precious gemstone sterling silver earrings Garnet, Amethyst, Peridot; Coral Duncan Hakea Bird sculpture- banksia pod, fleece, mallee root Single or double; Anne Morrison Glass various colours Lg rectangle dish; Bird dish; Sm rectangle dish; Fred Peters Pendants on silver chain -special Christmas price! With a little more scope in your budget, you might have thought things would be easier. It’s true. With so many stunning options still to choose from for under $100, your 2016 hunt for Christmas gifts is almost over! These totally unique anodised aluminium servers feature different cut out shapes in the handles. Red, gold or silver will dress up your Christmas, or someone else’s. 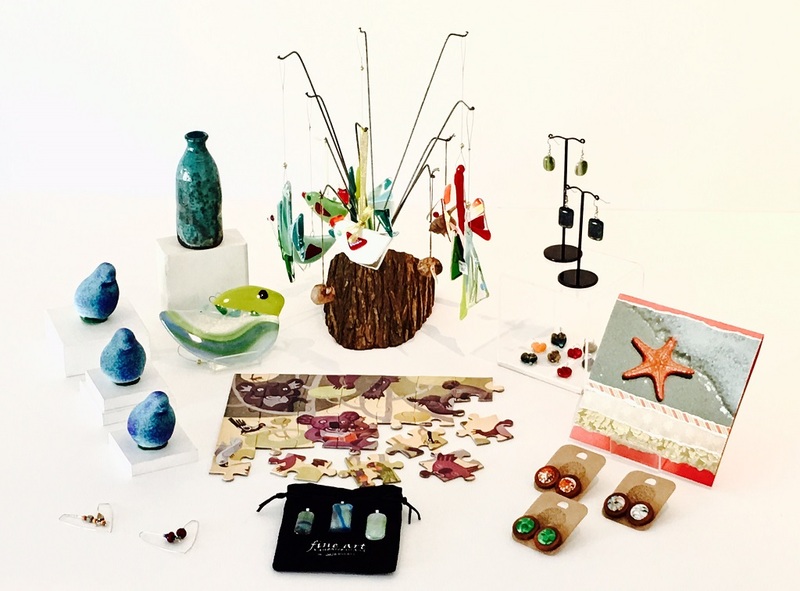 Each of these dramatic jewellery pieces reflects the colour and motifs of a Kangaroo Island landscape. Give it as a gift, or buy it for yourself and make your Christmas dreams come true. Team this small cuff with another, larger piece from above and make a dramatic statement for the new year. This stunning range from Llewelyn Ash Glass is hard to walk away from. Perfect for the person with an eye for high quality design. This larger version of the amazing raku bottle is perfect on it’s own, or match it with another from the items featured above. The only real problem is which to choose from the breathtaking array of finishes. Easy wearing and easy to buy. Come get them quick though, limited stock available. Oozing decorative form, this striking raku piece is made to enhance that special spot in any home. Of course the semi precious gems in these are gorgeous, but it’s Peggy’s ability to fashion settings that are as breathtaking as the stones, that will have you spellbound. Lovingly crafted from carefully chosen natural materials. You’ll be in their thoughts for a long time to come when you give these exclusive glass plates. And you know they’ll think of you often. Let’s face it, they’re so beautiful, who could stop looking at them? It’s Christmas, and Fred is in a generous mood! The owl and seahorse pendants are usually priced at $125, but Fred has reduced them both for the festive season. Step 4: Come in and see us! Yes, all that’s left to do is make your purchase. Naturally, we’d love to see you in our gallery at 91 Dauncey Street, so we can help you wipe out your Christmas shopping list in person. But there are also other ways to get it done. Use the contact form on our web site to get in touch. We’ll be happy to help you out via email. Call us on +61 8 8553 0448 or talk to Fleur on 0417 832 037 to arrange your purchase over the phone. With multiple secure payment options available, you’re assured of a stress-free shopping experience. We hope our easy Christmas shopping guide will help you nail down all your christmas gifts in no time, so you can relax and enjoy the thrill of the season. Need to go the extra mile? We have literally hundreds of exquisite art pieces available. For even more amazing jewellery art, come see us at the Bling It On exhibition and cocktail party, Thursday December 8th. If you’re looking to make a slightly bigger statement with your gift, you’ll find much more to choose from in our gallery pages.